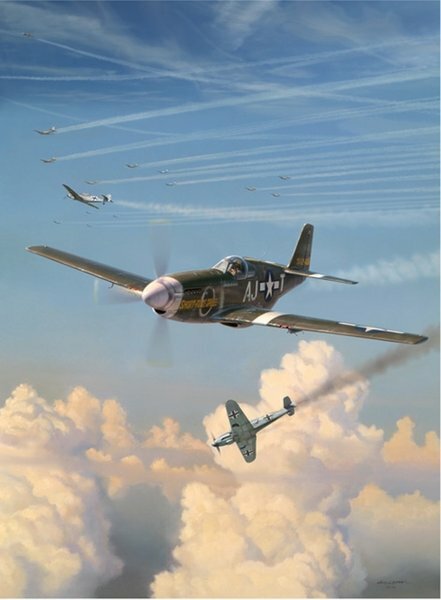 Image Size 11-½" x 21"
While escorting B-17's on a misson to Oranienburg, Germany, P-51 Mustangs of the 354th fighter Group, known as the Pioneer Mustang Group, were attacked by 15 to 30 Me-109s. Capt. Richard E. Turner was leading the 356th Fighter Squadron in "Short Fuse Sallee". When the Germans commenced their attack, Turner ordered the group to drop tanks and break to the right. At this moment, turner's engine quit because he had forgotten to switch the fuel selector switch to the internal fuel tank. After a few tense moments, he restarted his engine, but now had some Me-109s bearing down on him from the rear. He was alone now and didn't have enough speed to evade, so he dropped his wing flaps and the 109's flashed by him. Then, pouring on the power he got one of the enemy aircraft in his sights and shot it down. A minute later he was joined by two Mustangs which helped drive off the remaing 109s. The date was March 3, 1944.